What’s it good for? 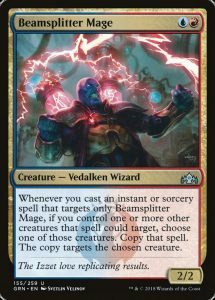 For nothing, because the Wizards Fan Content Policy prohibits fans from using Wizards‘ „gameplay“ in their content, which, I suspect, includes Magic: the Gathering rules. 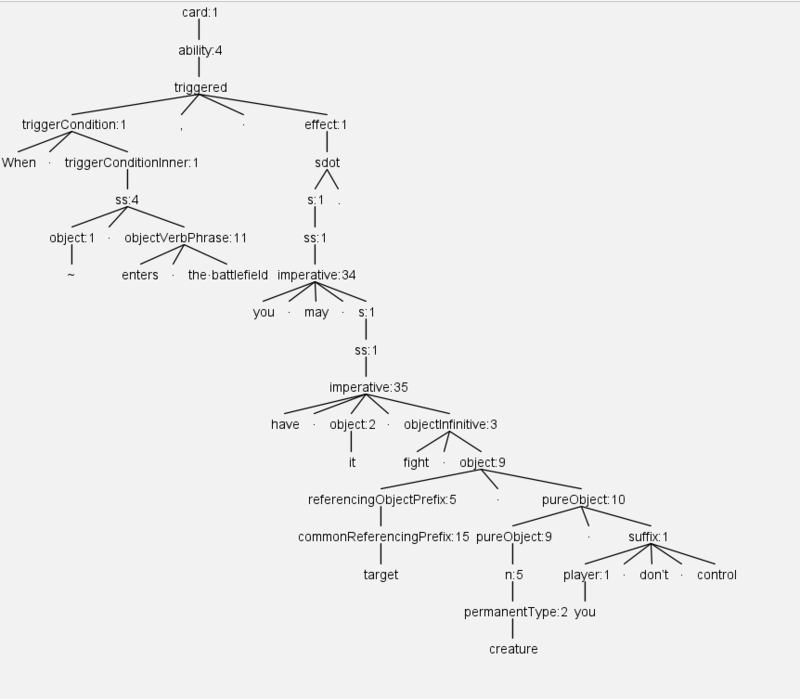 The idea is that, from this syntax tree, you can generate the code above automatically. 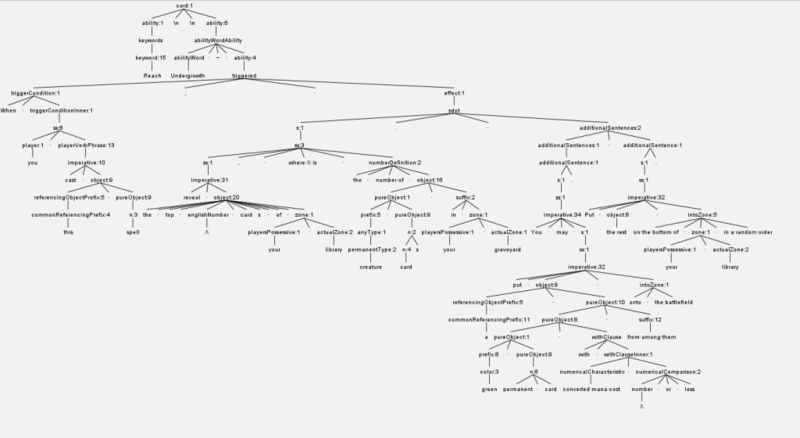 A syntax tree is no longer arbitrary English text incomprehensible to a rules engine, it’s an object that can be, in theory, unambiguously converted into code. The hope is that this way, it will be easier to add new cards (because nobody needs to script them) and that there will be less bugs (because nobody can make bugs in the scripts because the code is created automatically). There could be „bugs“ in the rules text, but that’s unlikely. 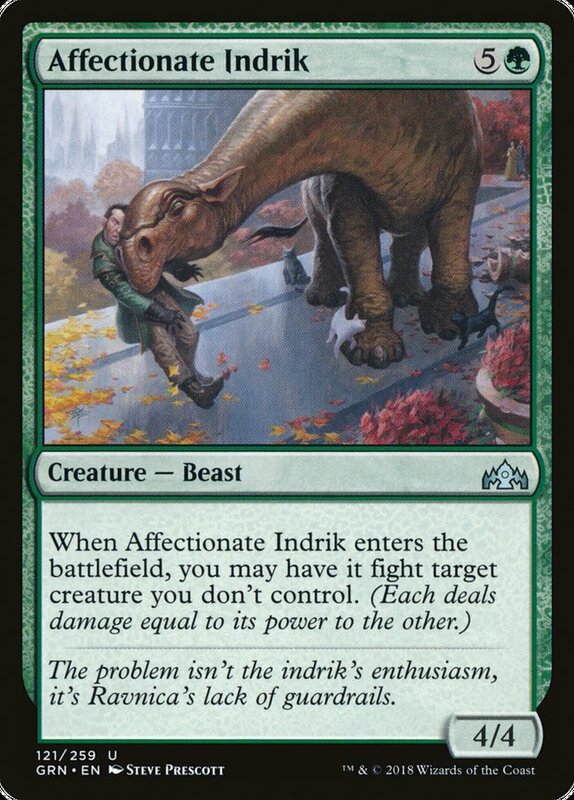 Wizards of the Coast pays attention to editing. I’ve only encountered a single editing error in the entire Guilds of Ravnica set (there’s a missing space between the end of the rules text and the reminder text for surveil in the card Mission Briefing). So the parser sees the phrase „those creatures“. Well, asks the parser, I wonder what those creatures are, I should look at the preceding sentence to figure that out. 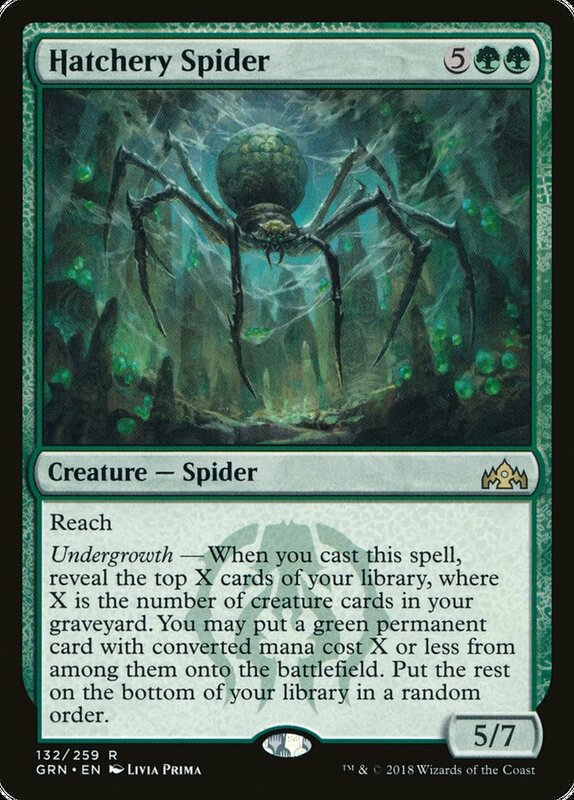 It does and it reads „one or more other creatures that spell could target“ and joyfully presents to the player as possible choices all creatures that spell could target. Flower reads, in part, „Search your library for a basic Forest or Plains card“. The parser interprets it as „a basic Forest“ or „Plains card“, as opposed to the correct „a basic card that’s a Forest or that’s a Plains“. This happens because it considers the words „basic Forest“ and „Plains“ to be of the same kind, when in fact one’s already a compound of a supertype and a subtype and the other is a subtype only. Aurelia parses, but incorrectly. It reads, in part, „that creature gets +2/+0, gains trample if it’s red, and gains vigilance if it’s white.“ Which the parser interprets as „if it’s white, it gains vigilance“ and „if it’s white and red, it gains trample and +2/+0“ as opposed to the correct „+2/+0 always“, „vigilance if white“, and „trample if red“. 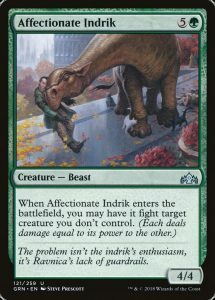 Pelt Collector reads, in part, „if that creature’s power is greater than Pelt Collector’s,“ which makes sense in English but is difficult to parse because the adjective-like ‚Peltr Collector’s‘ doesn’t qualify anything. It would parse correctly if it said „greater than Pelt Collector’s power“. 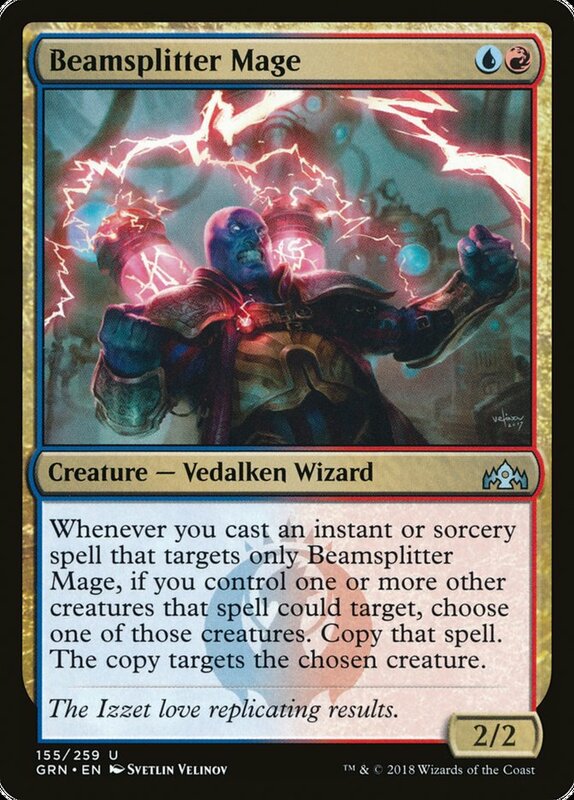 I thought that the template „[object] gains [abilities] until [something happens]“ would work for all ability-gaining abilities, but Chance for Glory reads, „Creatures you control gain indestructible.“ There’s no „until“, not after, not in front. They gain indestructible indefinitely. Oh well.